Established in 1941, The Institute of Internal Auditors (IIA) is an international professional association with global headquarters in Altamonte Springs, Florida, USA. The IIA is the internal audit profession’s global voice, recognized authority, acknowledged leader, chief advocate, and principal educator. Generally, members work in internal auditing, risk management, governance, internal control, information technology audit, education, and security. Globally, The IIA has more than 180,000 members. 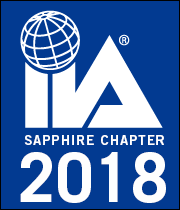 The IIA in North America comprises 160 chapters serving more than 72,500 members in the United States, Canada, the Caribbean (Aruba, Bahamas, Barbados, Cayman Islands, Curacao, Jamaica, Puerto Rico, and Turks & Caicos), Bermuda, Guyana, and Trinidad & Tobago. Members enjoy benefits offered by the North American Service Center including local, national, and global professional networking; world-class training; certification; standards and guidance; research; executive development; career opportunities; and more. Internal auditors throughout North America enjoy free members-only webinars and national conferences such as the General Audit Management Conference, the Governance, Risk, and Control (GRC) Conference, and the All Star Conference. The IIA’s Audit Executive Center provides chief audit executives relevant and timely thought leadership and connections to peers for benchmarking and sharing best practices. And resources such as IIA Quality Services make The Institute an indispensable partner to you and your organization.